We at Fidelis Interactive have studied the way mobile devices have changed the way marketers deliver relevant promotions. The importance of mastering the channel is fact based; in 2015 traffic on mobile devices surpassed desktop. With this permission to engage comes a brand’s responsibility for delivering compelling and relevant experiences. 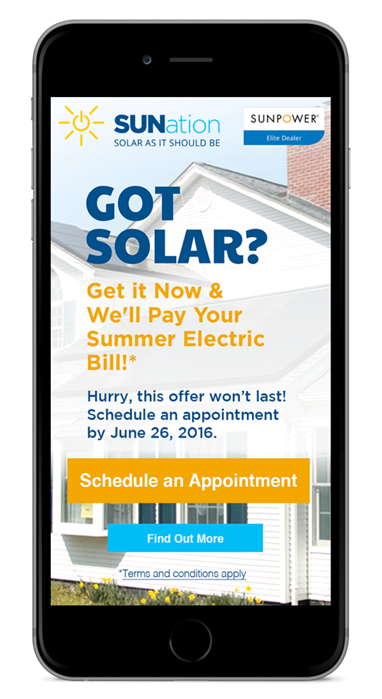 SUNation a regional installer of solar panels uses mobile in a manner consistent with their core objective. SUNation’s only goal in the mobile channel is to create curiosity. The offer directs customers to a place where they can begin to learn more and to easily take advantage of a high value promotion or discount offer. A clean experience aimed at taking the mystery of out of pricing and installation options. A simple experience based on a critical insight; take out fear uncertainty in doubt. And as a considered purchase the aim of the campaign is to generate interest not necessarily closure. That is turned over to the capable hands of a sales team for something as considered a purchase as solar panels. For more information about how to approach your mobile promotion strategy and tactical plan for this year’s holiday season please reach out to us at Fidelis Interactive. www.fidelisi.com. paul@fidelisi.com.